Books your class will LOVE! Every month, our children's book experts hand-pick award-winning books and classroom extras targeted to the age and interests of you and your class. First, find the box that's right for you and your class. Personalized for Preschool through 8th grade classes. 3-4 books, plus extra classroom materials in each box. Delivered monthly. 4-6 books, plus extra classroom materials in each box. Delivered monthly. 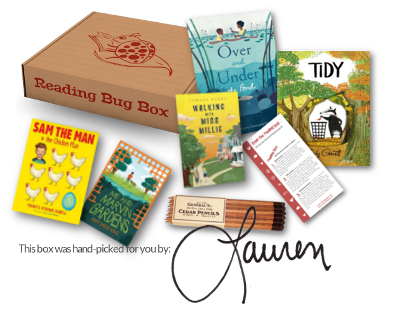 A Reading Bug Box helps inspire young readers at home or in the classroom! Whether homeschooling or building a classroom library, let the in-store experts of The Reading Bug curate a selection of the very best titles every month to help support the class curriculum and introduce new topics. Each box features hand-selected books targeted to the unique interests, grade level and topic of the students. Boxes also include an extra item for the classroom each month - such as bookmarks, classroom activities, posters or a lesson plan idea matching one or more of the books. You choose your plan and tell us all about your classroom needs, ages and reading levels. 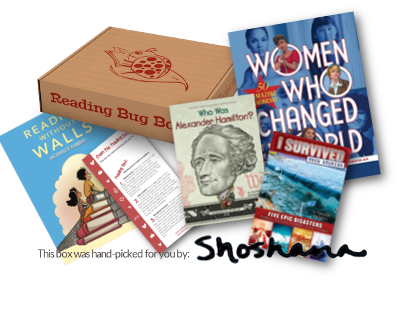 Our kidlit experts match great books and extras, lovingly pack your Reading Bug Box and send. You delight in watching your reading bugs learn, thrive and expand their imaginations! The Reading Bug is a family-owned, independent children's bookstore in San Carlos, CA, and our staff delights in matching the very best books to the unique interests of every child. Our mission is help everyone - from the most reluctant readers to the most voracious - and we love helping children expand their minds and branch out into new genres, or watch them eagerly come back for the next book in a series!